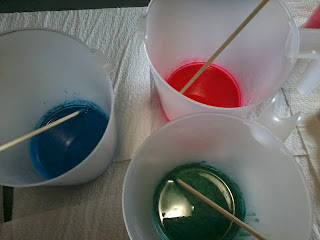 It seems that the only time I am making soap lately is for these challenges. Which is a great thing considering we are coming up to our summer market season. This months challenge is a multi coloured gradient soap. I have done the single colour gradient, with my turkish mocha soap and loved the effect. so I was really looking forward to doing this one. I pondered what colours to do and one day when my daughter and I were coming home from a day in town the sunset over the mountains was so spectacular, with the snow and clouds over the blue green of the mountains and going up into the pinks of the sunset. I thought that is what I am going to do. I was a bit worried about the green as I thought I was out of green, but it turned out that I had some green mica, and blue mica then I used fuchsia for the pink. Well I didn't disperse the micas well enough and the mix of both the green and blue looked blah. so I added a bit of blue ultramarine to the blue and the green just had to stay the way it was. I scented with a mix of lemon, lime, rosemary, peppermint and juniper EO's. Colours all mixed and ready, well almost mixed as I found out too late. 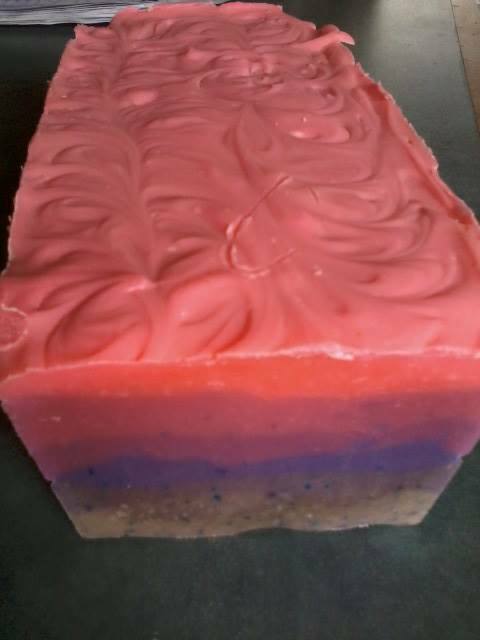 The finished soap just before cutting. I am very happy with it, I just have to pretend that the mica dots are trees on the hills. Love the sunset colors and the dots are not that bad. But did the green morph to brown? Yes both the green and blue morphed to brown, I assumed that because I didn't have enough green mica, but when I saw the dots I thought maybe that was why. but after reading your comment I am thinking maybe the mica wasn't stable in CP. I was able to save the blue by putting in some ultra marine. But I had no green. I think your soap looks great! I haven't been able to take part in the last 2 challenges and I miss them. Next one, hopefully. I love looking at everyone's soap though. I really love the pink in this one.